When we speak of whitetail transitioning or deer hunting transitions this doesn’t always refer to the changes in land structure or parcels of property. Transitions can also mean that time or period where the whitetail deer, or elk for the matter, changes it’s daily routine. This is often prompted by weather and the time of year where physical changes have been taking place in the animals body and are nearly peaking to heightened levels such as estrus or rutting. These physical changes can demand different requirements just as a nursing doe needs more enriched foods to sustain her milk production for the fawn. This, as well as the loss or appearance of new food substances throughout the year can pull or push the deer into other areas of their home range. In essence they are transitioning into another phase of survival or breeding for the year and your recognition of this change can help you fill your tag. Since the two areas of transition can affect and encourage one another I will tackle both in this article. First lets take a look at areas of land that transition because these alone can hold deer year round and play an important role in a deer’s daily movements. Let’s take for example a rolling hillside of hardwoods. Nothing special in the summer other than the sheer beauty of a maturing maple stand. In terms of food there’s not a whole lot of great browsing to be had here. The real benefit comes later in the year where these open hardwoods become a great place for a buck to announce it’s dominance through rubs and scrapes. These areas are obviously very visible and when a buck plops it’s business card on the table, so to speak, it often looks for areas of high visibility and traffic. Now team this area of hardwoods with an adjacent or surrounding swamp and this suddenly becomes the best seat in the house due to the transition from low swampy land to higher dry hardwoods. If you have an extra treestand you would be well served to survey the entire area and probability of travel into the equation and make a decision of setting your stand. Although this is only one example of a land transition, I’ll cover more in a bit, here’s a few things to consider before hanging a stand. Check the trails to and from the area. Yes this is your basic advise but many hunters don’t realize that an area like this that transitions later in the year is not going to look like a great hunting spot right now. So, the deer sign you will be reading is nearly a year old. The trails may not show any sign of use at the moment but the fact that the trails exist are your key. It doesn’t take long for an average deer trail to disappear when not in use so the trails should look faint or as if they do not receive much traffic. In all actuality they may not see much traffic but they may receive the right traffic. Other deer sign you want to look for are old buck rubs. Now just about any hunter can pick out a rub from the year before. Pretty obvious. But take a closer look around if you find a rub from last year. Since mature bucks may hold the same secure pattern year after year it’s not uncommon to see rubs from years gone by. Now these rubs will not look like last years stock. In fact they may look more like a scar on the tree and older rubs will be higher on the tree. The older the rub the higher on the tree if the tree continues to grow annually. Looking for these rubs at your average rub height is fruitless. Point in case I moved to this cabin 15 years ago. There was a fresh rub at the edge of the yard on a small poplar sapling. A great selling point for the place as I recall. Last year the wind snapped that same sapling off at the 6 foot mark, which had become a 20 foot tree. That’s right where the scarring from the rub was after all those years. My point is look beyond the obvious when looking for old rub lines or cluster rub areas. If you can identify deer trails that appear to have been abandoned, and old buck rubs along those trails, then you’re probably looking at a later season transition zone. If nothing else it’s worth a look in late December if you still have access to verify use of the area. Now some other land transitions that often bode well for the deer hunter are fields. Fields of course can be farmland fields or just abandoned fields and they will vary greatly in size and shape. Try not to focus as much on the size of a field as much as the shape is the defining factor since deer need to enter the field from some point of it’s perimeter. The defining features of the tree-line that surrounds a field could be very obvious. For example a small stretch of trees that stretch out into the field is going to provide a great staging area before the forest gives way, or transitions, into a field. At a bare minimum an area like this should create a natural entry point into the field. You will often find at the edge of a field that deer use many different entry points but the best choices will encompass everything a deer needs to make the safest entry and exit if needed to and from the field. There’s a lot to be written about hunting fields, especially with archery equipment, but that’s for another article. Another great transition area that’s very obvious to the untrained eye is the introduction of water whether it be a pond, lake, or bay. It’s the one very defining transition area that can be identified as readily as a large field. The one aspect that also plays into the hand of transition here is the prospect of predators. This is especially true if the body of water is relatively small. Just like you will be able to pinpoint entry areas to a small pond so too will predators. This, unlike the other transition areas we have discussed, holds the factor of life through the need for water intake on a regular basis. Deer are masters at conservation especially when speaking of body energy so they realize a quick trip to the pond for some fresh water is the least imposing in terms of retaining caloric intake. What many hunters fail to realize is that the water source seldom ends at the waters edge. Scan the area away from the pond or main body of water and look for clues like cat tails. These are a sure sign that the ground below is quite moist which may produce a secondary water source using relatively very little energy. In short the trade off of energy used by the deer may trump the fact that they can steer clear of the main body of water, and the predators, for the time being. The importance of realizing and understanding the transition between land masses will come back to serve you well when decoding a deer’s needs during a specific time of year. That specific time of year will likely be while you are hunting. Let’s just look at some very basic requirements between transitioning deer and the type of land that will be required. Early spring. A time of plenty when deer have fresh food everywhere. Not really. Having fresh food everywhere never works in a completely true statement. Early spring the deer are finding the fresh new shoots of green grasses and legumes sprouting from the ground in areas where they are exposed to plenty of warmth and sunlight. Deer will transition into feeding in open fields. Although this is of little use to the hunter, since you likely cannot hunt during this time of the season, it is the basis of knowledge we’re after that will carry over into our actual hunt. Late spring to early summer deer now have food in abundance and the days when they were subjected to feeding in the open fields have changed for the better. Deer can now afford to browse at their leisure. Often this will include browsing the edges of fields rather than right out in the open. Small meadows deep inside the forest are a safe haven from humans and offer a bounty of fresh browse material. Mid summer to early fall we see the deer transition yet again to more foods that have begun to come into season. Farmlands are disappearing except for those with late season gourds, rooted vegetables, and ground cover. Water begins to factor into the equation more each day as the deer are beginning to browse on less succulent plant materials which previously provided a small portion of their liquid intake. Depending on where you hunt this is probably the portion of transition that a growing number of hunters experience. During this period a major key would be water if it’s not already plentiful. Lowland areas and small pockets of sunlight inside the treeline will have slowed the growth of plant life throughout the hot dry summer. Now is the time to key in to those areas as the deer will be feeding here. Late fall through winter is going to incorporate most hunters and again depending on where you hunt will dictate how you hunt. Here in the Upper Peninsula of Michigan we can be under snow for 5 solid months and have snow on the ground for as many as 7. To punctuate the importance of transitional deer it all comes down to this very critical winter for the deer herds around here. For most deer the scenario is no different, albeit probably a bit less extreme. During this time any greenery that is still above the snow is likely to be food. Young saplings from deciduous trees will be trimmed at the bud. Find either of these or a combination and you probably have a good case for a setup. Again any open water is also going to good bet as the water is warmer than the air in effect heating the surrounding elements and possibly keeping small plant life producing longer into the season besides the obvious option of a fresh water supply. If you look at the entire scenario from deer transitioning to other portions of their home range throughout the year you get a better picture of what a deer needs in it’s daily routine of survival. 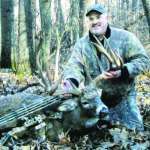 Understanding where a deer will find those needs can put you right in the path of a mature buck or a fat healthy doe. Either way, fresh venison for the freezer.